Lisa Thompson, a first-grade teacher at P.S. 78 (speaking), Dr. Irina Lyublinskaya, director of the CUNY Discovery Institute, and Sharon Cameron, a fourth-grade teacher at P.S. 45 at the Noyce Summit in July. The College of Staten Island’s Noyce Master Teacher Fellows program is part of a broad national effort to improve STEM education. Bringing participants together is one way to help them build off each other’s successes, share lessons learned, and network. 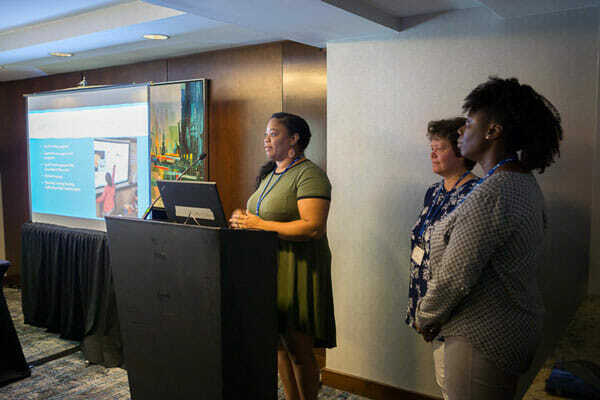 In July, two CSI Master Teaching Fellows and two CSI Teacher Education Honors Academy (TEHA) alumni, joined four CSI faculty at the Noyce Summit. The participants included Sharon Cameron, who teaches fourth grade at P.S. 45, and Lisa Thompson, who teaches first grade at P.S. 78; and, TEHA alumni Samantha Haimowitz, who teaches mathematics, and Stephanie Palumbo, who teaches biology, both at New Dorp High School. Both groups of teachers had poster presentations. In addition, Cameron and Thompson co-presented workshop with CUNY Discovery Institute Director and Noyce Principal Investigator Dr. Irina Lyublinskaya. About 30 educators at the event listened to the teachers from Staten Island present a workshop for the teaching of science in elementary school based on the NSF-supported program at the College. 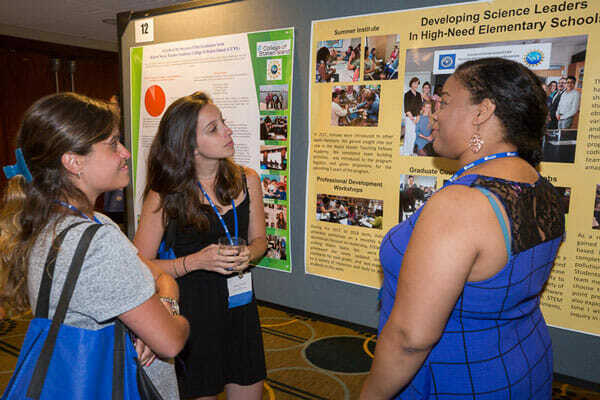 From left to right, teachers Stephanie Palumbo, Samantha Haimowitz and Lisa Thompson at the Noyce Summit in Washington, DC. “Attending the conference, was a life-changing experience from a teacher’s point of view,” Thompson wrote in a reflection. It was great “to meet a group of people who believe and have desire in changing the way we teach students science and math to ensure its relevancy and effectiveness in the classroom. Ultimately, that ripple effect – the Noyce teachers carrying their new knowledge and ideas into their district – is exactly what the Noyce grant envisions, Lyublinskaya said.